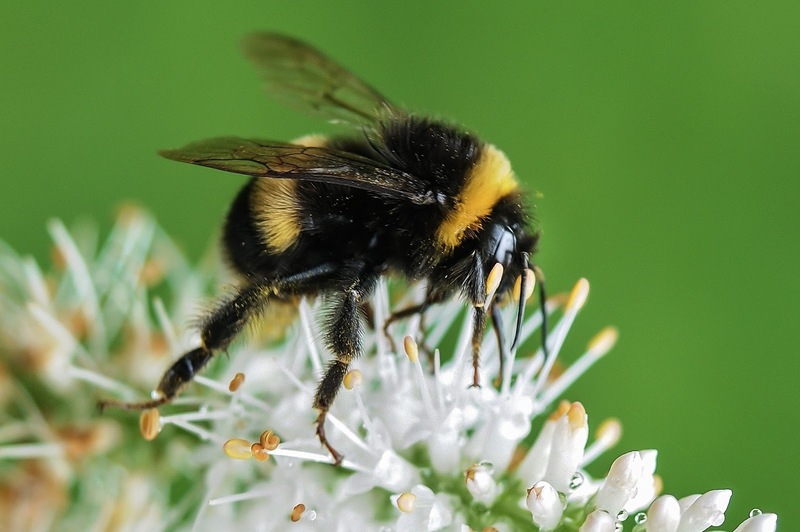 Have you ever wondered where bumblebees got their name? It is a fitting name because they do seem to bumble around as they hunt for flowers. In fact, early on in the science of entomology (the study of insects) this hard working bee went by another name --humblebee. It is thought this name came about as a result of the distinct hum bumblebees make as they fly. This hum is made by their wings which beet at around 130 times per minute. The name bumblebee came about later and for a short amount of time the two names were used for the same insect. Eventually, bumble be became the only name listed in scientific texts and humblebee was relegated to the past. Bumblebees are very hard workers. The entire colony works hard to serve the queen. Bees are known for their hardworking nature. they are so effective at pollinating that they are considered one of the best pollinator insects. Their fast wings spread flower pollen more effectively than other insects. This is known as buzz pollination and enables plants to produce more fruit. Worker bees gather pollen for food, clean and guard the nest. The queen is left with nothing to do but lay and hatch eggs. The queen will outlive the entire colony.1 But the worker bees do not complain. They go about their work faithfully carrying out the task God has given them. Humblebee seems to be a good name for them for more than one reason. Jesus had workers while here on earth. In Luke 22 we find them arguing about who among them was the greatest. Jesus gave them an important lesson which is one of the most memorable in the Bible. He said to them, “The kings of the nations lord it over them, and those who have authority over them are called ‘benefactors.’ But not so with you. But one who is the greater among you, let him become as the younger, and one who is governing, as one who serves." (verses 25-26, WEB). In other words, if you want to be the greatest, you need to focus on serving others. Jesus had to repeat this lesson multiple times to his disciples. They only finally got it once he had gone back to heaven. In God's kingdom, love for others is what matters most. It is easy to want to make ourselves the best. How long do you thing a colony of bees would last if they were all trying to be queen? Certainly not long. Then not only would the bees cease to exist but we would loose an important insect that helps produce our food. If we want to truly be workers for God, then we need to take a lesson from the humblebee. Has anyone ever done something for you they did not have to? Were they humble about it? The lesson said we should not work to be at the top but serve others instead, is this easy to do? Have you ever served someone with a humble attitude? How about someone who did not deserve it? Is humility good for us or just the people we show it to? Why? 1 Alina Bradford. "Facts About Bumblebees." January 13, 2017. Livescience.com. Accessed February 10, 2017 from https://www.livescience.com/57509-bumblebee-facts.html.